You Choose the text and we will print it. Makes a great gift for anyone! Looks great on the wall of a child's room, in the garage, man cave, where ever you like. Many colors to choose from. Type your text exactly the way you want it in the text box. Be sure to type it exactly the way you want it. We will print it exactly the way you type it so be aware of spelling and capitalization. we recomend ALL CAPS. 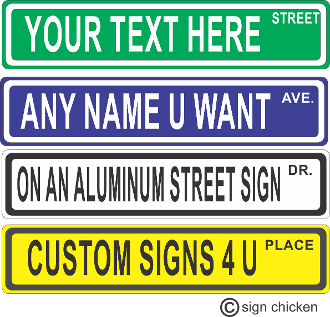 Choose "STREET", "ST.", "PLACE", "PL. ", "AVENUE", "AVE.", "DRIVE", DR.", "COURT", "CT.", "HWY", "PKWY", "CIRCLE" Oor "CRCL." and add it to the text box. let us know if you want pre punched mounting holes or no holes. If you do not specify we will ship it WITHOUT HOLES.